This timer is sturdy and simple to program.Unlike other small plastic timer housing, our timer is made of stainless steel. And it has very clear digit. You can see the time digit in long distance. Notice: this timer need to be pluged in for use . We design that for less batteries using. This timer is loud for noisy kitchen. It is perfect if you need it really loud. If you want it quiet,sound volume is adjustable. -4 timer windows can be set independently at the same time. This allow you to time 4 different events at once. 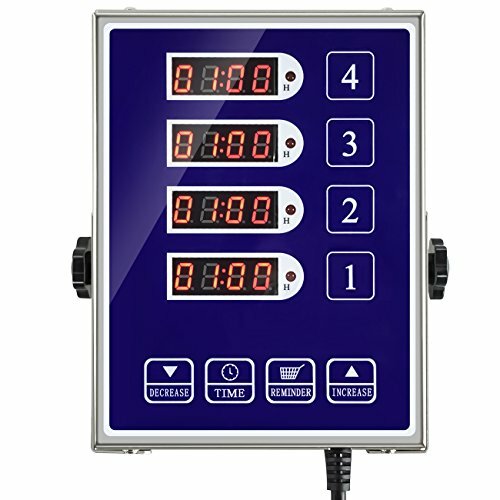 -This timer has 0000-99.59 minutes mode or 0000-99.59 hours mode.There is reminder/shaking basket function in each time window. -Easy-to-read digit display and comfortable buttons. -High decibel buzzer alarm designed for busy kitchen. You can hear the sound even in other room. Also the volume is adjustable and automatically recorded. Please turn the volume down if you want it quiet in your kitchen. -Stainless steel construction.Easy to clean and maintain. -This timer has two holder. It can be used to mount to the wall. Or it can be put on the table as stand. All you have to do is plug it in, set your time channels and start cooking. Plug and play. No batteries needed. Save batteries cost. Power cable: 1.5m/59inch power cable with US plug. APPLICATION- Great for kitchen to make your cooking more convenient. Easy Program to control.Need 110V Power. CONSTRUCTION - Sturdy, stainless steel housing, comfortable buttons,very clear Led time digit.No batteries needed. TIME MODE SWITCH - Setting hours/minutes mode or minutes/seconds mode. Range from 0000-99.59 hours or 0000-99.59 minutes. LOUD ALARM - Really loud for noisy kitchen. Also volume is adjustable.Lever High-Middle-Low-No Sound. MULTIPLE EVENTS - Each time window can be set independently,allow four cooking events at once. If you have any questions about this product by YOOYIST, contact us by completing and submitting the form below. If you are looking for a specif part number, please include it with your message.